PHILADELPHIA (WPVI) -- On the same day WWE Chairman Vince McMahon announced the return of his professional football league the XFL, 6abc spoke exclusively with his former right hand man Bruce Prichard. 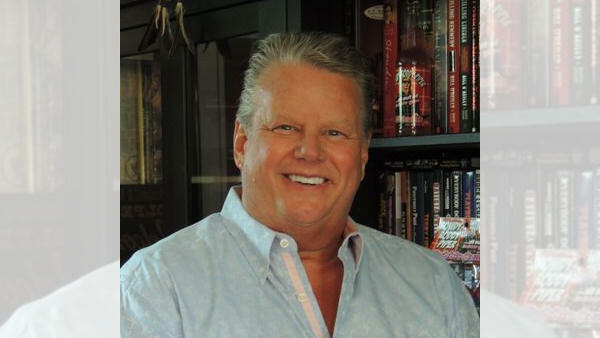 Prichard spent more than two decades working for McMahon as an executive and producer helping create WWE's television shows and collaborating with Superstars like Hulk Hogan, Andre the Giant, 'Macho Man' Randy Savage, the Ultimate Warrior, Stone Cold Steve Austin, The Rock, and John Cena. Prichard, who will be in Philadelphia this Saturday night for his 'Something to Wrestle With' show in South Philadelphia (more on that later in the article), was part of the team during McMahon's first XFL run in 2001. This time around McMahon will be running the XFL through his new Alpha Entertainment company. WWE chairman and CEO Vince McMahon announced the return of the XFL, a "reimagined" football league that would "have nothing to do with politics." "What is there to say about the announcement of the XFL in 2020? Like everybody else, I was highly anticipating this announcement. It was met with I think a little bit of mixed reviews because I think people wanted more. 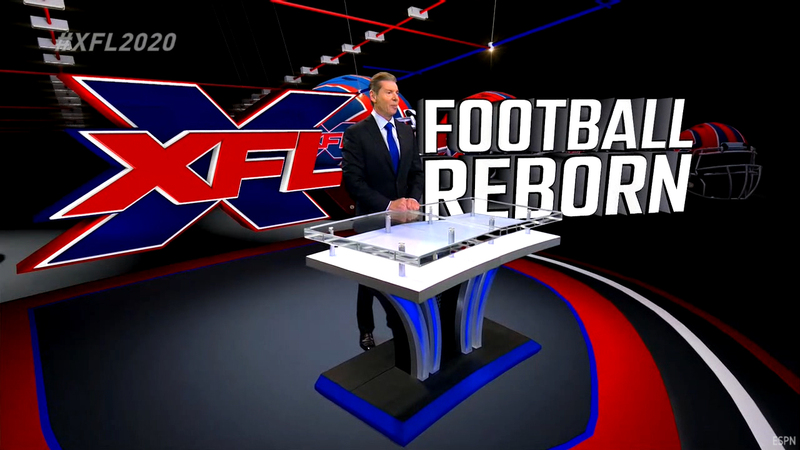 But, at the end of the day, the XFL is returning. Vince McMahon is at the helm, even though he says he's going to have the best in the business and professionals that know the football game and know that world. Vince will find the best. And Vince will hire the absolute best. I'm excited this time around because I don't think Vince often makes the same mistakes too many times over. And the fact that he is taking two years to launch this league is a sign of, I don't want to say maturity, but a sign of knowing the mistakes that he made last time and not wanting to repeat them. So already, he's not rushing into this. And, I'm excited for it. I think it's going to be something new. I've grown bored with the NFL. And Vince is going to make something exciting. I love the idea of a faster paced game, possibly with no timeouts, and changing the rules up a little bit as to what constitutes a catch. There are certain things about the current game of football that could be tweaked. While you still have to make the game as safe as it possibly can be, I do feel that there are some innovative things that can still be done, and if there is anybody that can innovate, and anybody that can make a big splash, that's Vince McMahon. With his new company, I'm excited. I wish 2020 was already here. But I think it'll be right around the corner and, for them especially, it will be here before they know it. But I'm excited about what the new XFL is going to bring and I think everybody else should be too because you never say never in this business. Just the likelihood of a Tim Tebow maybe playing football again, and some of the talent like a Johnny Manziel, some of the talent that is out there not currently with the NFL, for whatever reason, the XFL provides a new opportunity for a lot of talent to display their wares. I'm excited about it, so best of luck to them. Congratulations and I really hope it does well because I think competition is good for every business." It's no coincidence that Prichard, who also played an onscreen character known as Brother Love during the 1980s and 90s, chose this weekend to bring his popular podcast show to Philly. McMahon's WWE is taking over the Wells Fargo Center in South Philadelphia for four consecutive nights, highlighted by the annual Royal Rumble pay-per-view event on Sunday night. In fact, Mayor Jim Kenney announced it to be WWE Royal Rumble Week in the city. 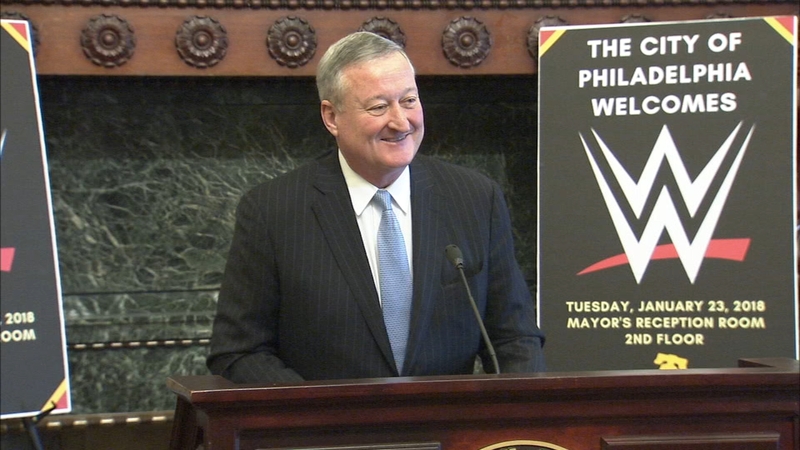 Mayor Kenney declares WWE Royal Rumble Week in Philly on January 23, 2018. Prichard, along with cohost Conrad Thompson, will be performing the live stage version of their Sports Illustrated Sports Podcast of the Year winning program at the 2300 Arena, a few short miles away from where all the WWE action is taking place. Tickets are available at Pronounspal.com. The 2300 Arena was home to Philly's popular, yet rebellious wrestling promotion of the 1990s - ECW. In fact, most fans still refer to it as the ECW Arena. Though Prichard has not worked for McMahon for almost a decade, he made a surprise return to the WWE this past Monday night, portraying his Brother Love character for Monday Night Raw's 25th anniversary special. Just prior to the XFL announcement, 6abc spoke with Prichard about being welcomed back to the WWE, his interaction with McMahon, what the Philadelphia audience means to the WWE, and his thoughts on the Royal Rumble event. First, the Royal Rumble. Next, WrestleMania? 6abc: You returned to the WWE after years away, portraying your famous character from the 1980s/90s Brother Love. What was it like to be part of Raw 25? Bruce: Returning to Raw 25 after all these years of being gone, I haven't been there since 2009 really. I left December of 2008, but to be able to able to portray Brother Loved one more time was absolutely thrilling so I'd be lying to you if I said I wasn't excited. I had a blast. It was terrific to see everybody. I kind of ended up hanging out with old friends like Teddy Long and Ron Simmons and the Godfather, John Layfield, Eric Bischoff. It was exciting to just see everybody and I think that that was the most fun to reconnect with guys like John Cena and to meet some of the the new Superstars which was pretty cool. 6abc: Did you speak with Vince and if so, could you elaborate on the conversation? Monday Night Raw in the hallway and it was a short 'Hello. Have fun.' And at the very end, I thanked him and gave him a hug and that was it. Spoke to [Vince's children] Stephanie and Shane, as well, and it was great to reconnect with both of them. So all in all, it was an exciting day, a great night, a lot of history made, and, in a word, I had a blast, so it was it was an awful lot of fun. 6abc: Your podcast 'Something to Wrestle With Bruce Prichard' won the 2017 Sports Illustrated Sports Podcast of the Year. There are a ton of wrestling podcasts out there, why do you think this one is so popular? Bruce: It blows my mind because I never thought anyone would want to listen to me speak for three minutes, much less three hours plus on a weekly basis. But I have a lot of fun doing the podcast. I think that the reason we stand out so much is because our format is different. I've got a great co-host in Conrad Thompson and he does his research and he digs deep, but he takes it from a fan perspective and a fan point-of-view. He asks questions that the people sitting at home want answers to and he digs deep and if he's not satisfied with the answer, he'll dig and dig and dig. Sometimes there's no more to an answer, but he's not gonna stop until he's satisfied. So the dynamic, the fact that we're friends, and we compete and we kind of have a lot of give-and-take on the podcast is a little bit different format and that works out for us pretty well. 6abc: You worked in the wresting business for the better part of three decades. Did you ever think you'd be doing a podcast talking about it? Bruce: Never ever in a million years to think I would be doing a podcast, but I'm happy I am and I'm extremely happy with the response that I've gotten from so far. 6abc: How is it different than your weekly audio podcast? Bruce: Our live shows are an extension of the podcast with the volume turned way up. On the live shows we discuss things that we just can't talk about on the podcast. So sometimes it's a little bit more risque, sometimes it's a little bit more out there, but it's a lot of fan interaction as well, and we are able to get fans' questions. They can ask us questions on stage and we have that interaction, so that makes it a lot more unpredictable and a little bit more fun. 6abc: You are holding this live show at the old ECW Arena. Will there be surprises? Bruce: We like to surprise people with special guests and the fact that we are going to be in the old ECW Arena, it will mark the very first time that I have ever performed at the 2300 Arena. I had the opportunity to tour it not long ago, maybe six months ago for the first time and that was nice to just kind of walk through that bit of history. It's gonna be an awful lot of fun. We're gonna have an awful lot of surprises and you can get your tickets at Pronounspal.com. It's a huge doubleheader. I mean, we're gonna have Jake 'the Snake' Roberts there as well, who's gonna do his one-man show before us. Then we will come on later in the evening and if people are going to the WWE NXT event down the street, we won't go on until that show is over. So you can come on down and enjoy both. See NXT and 'Something to Wrestle With.' Or see Jake 'the Snake' and 'Something to Wrestle With,' it's all one ticket price in Pronounspal.com and we're gonna have us good, rowdy fun. 6abc: When you were working as Vince's second in command, how important was Philly to Vince? Bruce: When I was working with Vince, I think Philadelphia, especially when I started in, and even now, Philadelphia has always been considered a traditional town for the WWE because it was one of the original territorial stops that his father had going back into the 40s, 50s. It was always a part of the tour. So Philadelphia was kind of like a hometown city for the WWF and WWE. 6abc: How would Vince describe the Philly crowd? How would you? Bruce: The Philadelphia crowd is unforgiving. They're passionate. They're honest and they're gonna let you know exactly what they want, so if you can get something over, as we say in the wrestling business, if you can get something to work in Philadelphia, then you know that that's gonna work everywhere because if Philly fans will buy it, much like the New York fans, then most people are gonna buy it. I love the Philadelphia fans. 6abc: Is there a specific Philly memory you have from your WWE years? Bruce: As far as a specific Philadelphia memory for me, I think was coming back as Brother Love in the early 2000s when I came out of a box to surprise the Undertaker. And for all of the things that I've done in Philadelphia, and of course Philadelphia is the city of Brother(ly) Love, that probably stands out because it was the first time that I got to do anything adversarial with The Undertaker. (Brother Love was The Undertaker's first manager in the WWE back in 1990.) I enjoyed that the most. It was the first time we got to do it and it was the one and only time we got to do it. Philadelphia definitely holds a special place in my heart. 6abc: What are your thoughts on WWE giving the women superstars their own Royal Rumble match for the first time? Bruce: The fact that they are having a women's Royal Rumble just tells you how far the business has come and I think that it is great that they are actually gonna have their very own match. I hope at some point they have their very own pay-per-view and their own television show because they're deserving of it. Right now, it's a good mix, but I'm excited to see what they're gonna do with the women's Royal Rumble. I just think it is about time and I think that people are gonna dig it. I think they're going to love it. 6abc: Do you think fans will enjoy two Rumble matches in one night or will it be a little too much of a good thing? Bruce: Having two Rumbles in one show concerns me a little bit because those are two long matches and they're the same type of match. It's kind of like having a night of cage matches or a night of the same gimmick matches. It can wear on you after a while, but I'm confident that they'll be able to make it different enough that people will enjoy it and pretty much be into everything that they do. 6abc: Who do you see winning the the men's and women's Rumble matches? Bruce: I'd like to see Asuka win the Women's Royal Rumble. A lot of rumblings about who's gonna be in it. A lot of rumblings about Ronda Rousey and other people, but let's see someone new and Asuka is new enough I'm a big fan of hers. I enjoy her work. And I hope Roman Reigns wins because it's where he got booed out of the building a few years ago for winning the Royal Rumble. I'd love to see Roman Reigns win again and just take it home, take it home to the house. 6abc: What is your favorite Royal Rumble match? Bruce: My favorite Royal Rumble? Wow. Probably, and this is only because it was the first one that we started with the winner getting a WWF Championship match, and that was 1993 which Yokozuna won. It wasn't an artistic success. The best, favorite one would have been the one that we did in San Antonio at the Alamodome by far. I thought that was the best I was involved in. Steve Austin won that one. The 1992 Royal Rumble where Ric Flair won the WWF Championship still is gonna hold up as far as the best Royal Rumble in the history of Royal Rumbles. It was expertly put together and very well performed. 6abc: Thank you for your time. Bruce: Thank you for the questions. Tickets to the double-header of Jake 'The Snake' Roberts and 'Something to Wrestle With Bruce Prichard' show are available at Pronounspal.com. Tickets for the WWE Royal Rumble Weekend events at the Wells Fargo Center are available at ComcastTix.com.